20120301 - Worked all day had a late call... Jack gave a report/speech on Amelia Erhart in school toady. 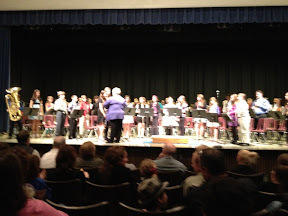 We had dinner and then rushed out to D's Band Concert. There were lots of people there we knew and this one way a bit better then the first band concert... Home and the usual to bed routine.